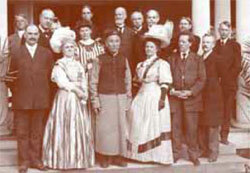 Dating back more than a century, the connection between the University of Illinois and China continues to deepen and grow. A century ago, the journey from China to Illinois cost at least a month’s travel by ship and rail. Today, sleek jets make the main jump in 13 hours, arcing poleward – up out of Beijing, across Mongolia, along the Beaufort Sea, over Canada and down into Chicago, the far-below terrain ticking by, remote as the past. Once buried in its vastness and obscured by its language, China has exploded into a present of access and opportunity, becoming a global powerhouse of manufacturing and upward mobility – a transformation in which the University of Illinois has been engaged since opening doors to students from the Middle Kingdom more than a hundred years ago. What’s changing about the relationship is what’s changing about everything in the new millennium – the speed with which technology makes communication and collaboration possible. Yet China remains, in the depth of its history, the distinction of its culture and the huge promises and challenges of its future, an enigma to the West and perhaps even to itself. What follows is not so much an overview of the relationship between the U of I and China as a series of stories that have emerged from that relationship. For, East or West, stories are how we understand. The remarkable tale of Bo Zhang, MS ’92 ENG, PhD ’99 ENG, is not just about one individual’s amazing rise but the profound changes that have come to China in the past half-century. Separated from his parents at the age of 8 by the cruel logic of Mao Zedong’s Cultural Revolution – which decreed that the educated must change places with the peasantry – he and his sister were transported to the chilly, remote province of Qinghai and essentially left to fend for themselves. Four decades later, Zhang is an international businessman whose past and present manufacturing ventures include electronic motors, medical imaging, motor shafts and hydraulic rescue equipment (used after the devastating 2009 earthquake in Sichuan). One component of this stupendous success is the sheer perseverance that got him into school, then university, then a government post, then – and this move was exceptionally courageous because he had to leave his secure job – graduate school in agricultural engineering at the U of I.